Underneath the desk I have stuck a grid of RFID tags, and on the top surface, the same grid of post-it notes. 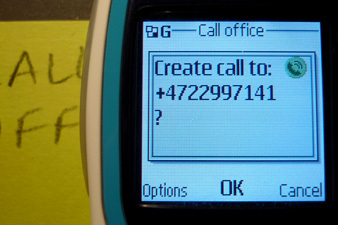 With the standard Nokia Service Discovery application it is possible to call people, send pre-defined SMSes or load URLs by touching the phone to each post-it on the desk. On the post-its themselves I have hand-written the function, message and the recipient. This is somewhat like a cross between a phone-book, to-do list and temporary diary, with notes, scribbles and tea stains alongside names. Initial ideas were to spraypaint or silkscreen some of the touch icons to the desk surface, and I may well do that at some point. 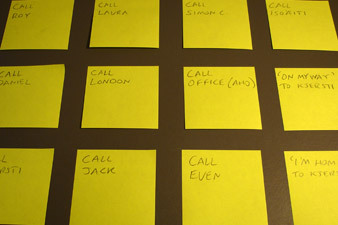 But for quick prototyping it made sense to use address labels or post-it notes that can be stuck, re-positioned and layered with hand-written notes. 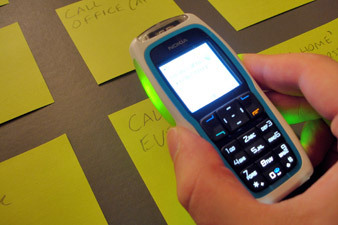 This is an initial step in thinking about the use of RFID and mobile phones, a way of thinking through making. In many ways it is proving to be more inconvenient than the small screen (particularly with the occasionally unreliable firmware on this particular cover, I can’t speak for the production version). But it has highlighted some really interesting issues. First of all it has brought to the forefront the importance of implicit habits. Initially, it took a real effort to think about the action of using the table as an interface: I would reach for the phone and press names to make a call, instead of placing it on the desk. But for some functions, such as sending an SMS, it has become more habitual. SMSes have become more like ‘pings’ when very little effort is made to send them. At the same time they are more physically tangible: I rest the phone in a certain position on the desk and wait for it to complete an action. The most useful functions have been “I’m here” or “I’m leaving” messages to close friends. I have had to consider the ‘negative space’ where the mobile must rest without any action. This space has potential be used for context information; a corner of the table could make my phone silent, another corner could change my presence online. Here it would be interesting to refer to Jan Chipchase’s ideas around centres of gravity and points of reflection, it’s these points that could be most directly mapped to behaviour. I’m thinking about other objects and spaces that might be appropriate for this, and perhaps around the idea of thoughtless acts. If this was a space without wireless internet, I could also imagine this working very well for URLs: quick access to google searches, local services or number lookups, which is usually very tricky on a small screen. Here it would be interesting to think about how the mobile is used in non-connected places, such as the traditional Norwegian Hytte [pdf]. This process also raised a larger issue around the move towards tangible or physical information, which also implies a move towards the social. As I was making the layout of my address book and associated functions, I realised that maybe these things shouldn’t be explicit, visible, social objects. The arrangement of people within the grid makes personal sense; the placement is a personal preference and maps in certain ways to frequency and type of contact. But I wonder how it appears to other people when this pattern is exposed. Will people be offended by my layout? What if I don’t include a rarely called contact? Are there numbers I want to keep secret, hidden behind acronyms in the ‘Names’ menu? It will be interesting to see how this plays out and changes over time, particularly in the reaction of others. I’ll post more about the use of NFC in other personal contexts in the near future. The desk is made from 20 mm birch ply, surfaced in Linoleum. I stuck a single RFID to the underside, in the place that felt most natural. A 10 cm grid was worked out from that point, and the RFIDs were stuck in that grid, and the same worked out on top. 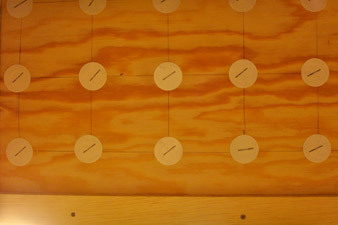 If I were to re-build the desk with this project in mind, the tags should probably be layered close to the surface, between the ply and Linoleum. This would make them slightly more responsive to touch by giving them a larger read/write distance. p(caption). Rewriteable 512 bit, Philips MiFare UL stickers. p(caption). 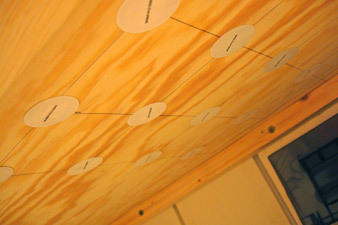 10 cm grid of tags on the underside of the desk. p(caption). 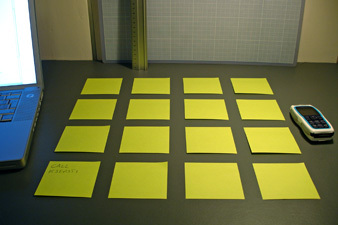 Blank post-it notes on the surface, with the same grid. How about putting the tags under a glass plate on top of the desk even with the notes on them? …or behind a dry-erase marker whiteboard?? or for kids and the elderly… somewhere in the house, you could have a picture of the family and teach the child or elder to just place phone by picture if its an emergency… either way excellent work! I like Automatic’s idea above. From an end-user perspective, even if it’s not an emergency, it’d be good to be able to touch your phone to a photo of someone, and have it phone them. Following on the idea of touching a phone to a picture, consider the elderly person who might find phonebooks confusing and might not remember phone numbers. Have 5 pictures of family members on a desk and when they want to call their son (daughter, brother, etc…) they just touch the picture with the phone. It seems needlessly complicated to use this for the elderly & children. They already have phones with big huge speed-dial buttons, some come with simple icons, some have room to put small pictures on them (of loved ones, etc). All they have to do is lift the receiver & punch the button. You could touoch your phone on a “Taxi” sign to have it call an authorised taxi and send your ID so the taxi only collects you.